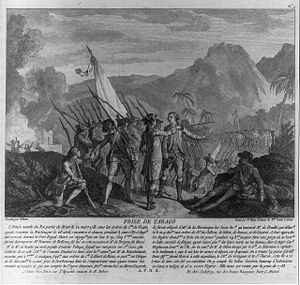 The Invasion of Tobago was a French expedition in May 1781 against the British-held island of Tobago during the American War of Independence. The fleet of the Comte de Grasse on 24 May landed troops under the command of the Marquis de Bouillé, which successfully gained control of the island on 2 June 1781. In March 1781, France sent a large fleet consisting of 20 ships of the line and a convoy with 6,000 troops to the West Indies under the command of the Comte de Grasse. They arrived off Martinique on 28 April, and de Grasse chased away the smaller British fleet of Sir Samuel Hood that had been blockading Fort Royal. Hood and the British station commander, Admiral George Brydges Rodney joined forces on 11 May between St. Kitts and Antigua to discuss the French threat. De Grasse met with Martinique’s governor, the Marquis de Bouillé, and developed a plan for capturing the British-controlled island of Tobago. The French forces were to be divided, with one convoy accompanied by a small number of battle ships to head for Tobago, while the other forces would make a landing on St. Lucia that was little more than a demonstration. These forces would then be withdrawn and also sent to Tobago, where they would assist the first force. The force for St. Lucia, led by de Bouillé and accompanied by de Grasse, left Martinique on 8 and 9 May, with the force for Tobago, led by Blanchelande and accompanied by two ships of the line and a number of frigates under de Rions, also departing on the 9th. Bouillé’s force, numbering between 1,200 and 1,500, landed at Gros Islet, a village at the northern tip of St. Lucia, early on 10 May. They surprised the small British garrison there, taking about 100 prisoners and seizing military supplies. This prompted General Arthur St. Leger, the island’s lieutenant governor, to organise the defence of Castries and fortify the slopes of Morne Fortune above that port. Two nights later, the French troops reembarked on the transports, and the fleet sailed off to the windward for several days before returning to Martinique on 15 May. Troops numbering 3,000 were then embarked, and the fleet sailed for Tobago on 25 May. Rodney was alerted to the landing, but rather than sailing his whole fleet to St. Lucia, he sailed for Barbados, detaching only a few smaller ships to the island’s aid. He was not informed of the French withdrawal from St. Lucia until he was en route to Barbados, which he reached on 23 May. On 24 May, the detachment of General Blanchelande arrived at Tobago. Under cover of fire from the Pluto and the Experiment, his troops were landed near the port of Scarborough. They quickly overran the town’s forts, and Governor George Ferguson led his remaining forces into the hills. These forces, three to four hundred regulars and four to five hundred militia, established a strong position fortified by cannons on the interior ridge. Blanchelande followed, but decided to wait for reinforcements rather than attack the position. Admiral Rodney learned of the attack on Tobago on 27 May, while at Barbados. He detached Francis Samuel Drake and six ships of the line and some troops on 29 May to provide relief to Ferguson, only to learn on 2 June that de Grasse’s fleet (20 ships of the line) had arrived and chased Drake away. De Grasse had arrived at Tobago on 30 May; Drake, greatly outnumbered, retreated, losing only one small ship. De Grasse then landed troops on both sides of the island the next day, and Bouillé made a junction with Blanchelande outside the British line of defence. They decided to attack the next day. With the arrival of French reinforcements, Ferguson decided to abandon his position, and began a retreat that night. The French gave chase the following morning when they saw the British lines had been abandoned. It was a sweltering, hot day, and both columns had men drop out due to the conditions; a number of the retreating British were captured. By the end of the day, Ferguson realised the situation was hopeless, and opened negotiations for terms of surrender. 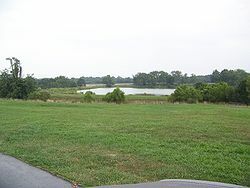 Under the agreed terms, Ferguson’s forces surrendered on 2 June. Rodney learned of Ferguson’s surrender on 4 June, and immediately sailed out from Barbados. When he finally spotted de Grasse’s fleet, the latter was sailing for Grenada with 24 ships of the line to Rodney’s 20; Rodney decided to avoid action, claiming later that he was concerned that chasing de Grasse would have left him to leeward, with de Grasse then free to attack Barbados. When Ferguson reached London, he and Rodney engaged in a highly public war of words over Rodney’s failure to relieve the island in a timely manner. De Grasse, after Rodney called off his chase, returned to Tobago, embarked some of the troops, and returned to Martinique. 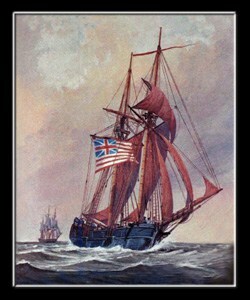 He then sailed in July for Cap-Français, where he was met by a dispatch from the North American fleet, whose news prompted him to sail north to support operations on Chesapeake Bay that culminated in the pivotal Battle of the Chesapeake and Siege of Yorktown. The island of Tobago remained in French hands under the terms of the 1783 Treaty of Paris that ended the war; it was again fought over during the Napoleonic Wars, and fell definitively under British control with the 1814 Treaty of Paris.